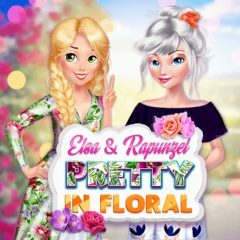 Elsa and Rapunzel will dress up in floral outfits. Help them and take a picture after! Elsa and Rapunzel are two fashion ladies and they need amazing looks every day. Floral fashion is in trend this year and they are going to use it. Can you help them?